“Trion” may sound like the name of one of the theoretical particles blamed for mucking up operations aboard the Starship Enterprise. But believe it or not, trions are real — and they may soon play a key role in electronic devices. Duke researchers have for the first time pinned down some of the behaviors of these one-of-a-kind particles, a first step towards putting them to work in electronics. Three-in-one particles called trions — carrying charge, energy and spin — zoom through special polymer-wrapped carbon nanotubes at room temperature. Credit: Yusong Bai. Trions are what scientists call “quasiparticles,” bundles of energy, electric charge and spin that zoom around inside semiconductors. Usually these properties – energy, charge and spin – are carried by separate particles. For example, excitons carry the light energy that powers solar cells, and electrons or holes carry the electric charge that drives electronic devices. But trions are essentially three-in-one particles, combining these elements together into a single entity – hence the “tri” in trion. 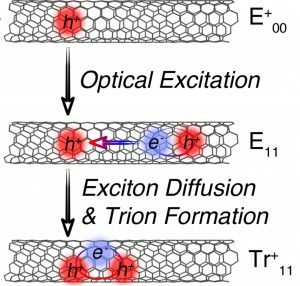 A trion is born when a particle called a polaron (top) marries an exciton (middle). Credit: Yusong Bai. Until recently, scientists hadn’t given trions much attention because they could only be found in semiconductors at extremely low temperatures – around 2 Kelvin, or -271 Celcius. A few years ago, researchers observed trions in carbon nanotubes at room temperature, opening up the potential to use them in real electronic devices. 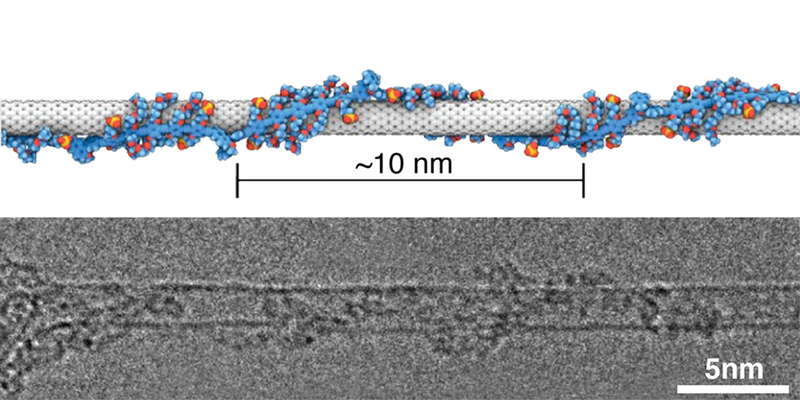 Bai used a laser probing technique to study how trions behave in carefully engineered and highly uniform carbon nanotubes. He examined basic properties including how they are formed, how fast they move and how long they live. He was surprised to find that under certain conditions, these unusual particles were actually quite easy to create and control. The team published their results Jan. 8 in the Proceedings of the National Academy of Sciences.